1947년 해방 이후, 부인회로 바뀌었던 명칭은 다시 여선교회로 복구되었다. 이때 회장을 맡아 여선교회의 재건과 부흥을 위해 노력했던 홍에스더는 감리회보를 통해 여선교회원으로서의 결연한 자신의 의지를 이렇게 피력했다. “ 친애하는 전선에 흩어져서 한뜻으로 활동하시는 선교회원 제위의 건강을 빌며 우리의 목적인 교회를 돕고 복음을 삼천만 동포에게 전하는 일에 전력을 다하여 활동하실 줄 아옵고 같은 뜻을 가진 여러분을 위하여 기도하나이다. 우리는 명예나 지위를 바라고 이 일을 하는 것은 아니요, 명예도 수고도 모든 것을 희생하고 노력하시는 줄 아옵니다. 여러분 우리의 이 아름다운 뜻을 잊지 말고 우리의 교회를 위하여 힘써 봉사합시다. 이것이 하나님께서 우리에게 맡기신 사명인 것입니다.” 첫 여선교대회가 개최된 정동교회에서 회장으로 추대된 홍에스더의 당부는 그녀가 20여 년 세월을 어떻게 여선교회에 헌신하였는지는 미루어 짐작되고도 남는 대목이다. 홍에스더는 1892년 서울 새문안에서 아버지 홍정우와 어머니 한메리 사이에서 장녀로 태어났다. 독립협회의 간부로 활동한 정치가이며 사회운동가인 아버지의 영향을 받아 일찍이 기독교 신앙을 받아들인 홍에스더는 이화학당에 입학하게 된다. 1912년 이화학당 중학과를 졸업한 이후 이화 여자 보통학교 교사로 활동하던 그녀는 1917년 이화학당 대학과에 진학했다. 대학과에 진학 중이던 1920년, 홍에스더는 여름방학을 이용하여 동료들과 ‘이화7인 전도대’ 를 조직하여 전국을 순회하는 전도여행을 나서기로 결단한다. 이들은 전국 순례에 앞서 흰 헝겊에 붉은 십자가를 두른 전도대 기를 만들고, 찬송가 곡조에 맞춘 전도대가도 만들었다. “우리는 다 주의 십자가 군병들, 그리스도의 나라 전파하기 위해, 복음을 손에 들고 전하러 나가세, 앞으로 나가 십자가 군병들, 기를 높이 들고서 앞으로 전진 전진하세” 전도대가 가사 속에는 나라 잃은 젊은이들의 민족애와 꺾이지 않는 기상을 담았다. 1920년 6월 첫 목적지인 평양으로 출발하여 낮에는 집집이 방문 전도를 하였고 들에서 일하고 있는 농부들을 찾아갔으며, 밤에는 소학교에서 강연회를 열었다. 가는 곳마다 많은 이들의 환영을 받았으나 일본 경찰의 감시와 방해가 집요해 결국 한 달여 만에 전도여행은 중지되고 말았다. 그러나 짧은 전도여행이었음에도 불구하고 무려 500여 명이 넘는 새 신자를 얻는 큰 성과를 거두었다. 1922년 이화학당 대학과 졸업 후 그녀는 미국 유학길에 오른다. 테네시주 스카릿대학 신학부를 졸업한 이후 1926년 귀국, 오늘의 감리교신학대학교인 협성신학교 교수로 부임하여 한국 최초의 여성 교수가 되었다. 그녀의 여성운동이 본격적으로 시작되는 시점이기도 하다. 1927년 조선여자 기독교 청년회인 YWCA 회장으로 취임하였고 항일 여성운동 단체인 근우회가 창립될 당시 중앙집행위원회를 맡기도 했다. 3.1운동 이후 교육사업과 폭넓은 여성운동에 참여해 온 홍에스더는 북감리회 여선교회와 남감리회 여선교회가 통합된 ‘기독교 조선감리회 여선교회’ 초대 회장에 선출된다. 기독교 조선감리회가 출범하면서 여성 목사 안수의 길이 열렸으며, 마침내 1931년 여선교사 14명이 목사 안수를 받았고 이듬해에도 여선교사 10명이 목사안수를 받았다. 이때 한국인으로는 유일하게 여선교회 회장인 홍에스더의 목사안수가 진행중이었는데 YMCA 운동가인 이명원과 결혼하면서 그녀는 목사안수를 포기하였다. 교역자는 가정의 책임이 없어야 한다는 당시의 통념 속에 결혼과 목회를 병행하기란 쉽지 않은 일이었을 것이다. 홍에스더가 여선교회 초대 회장으로 활동하던 시기, 일제는 전시체제를 강화하면서 한국교회를 탄압하기 시작했다. 1941년 친일적인 기독교 조선감리교단이 세워지면서 여선교대회는 해산되었다. 연 1회 모이는 지방 대표들의 화합의 장이던 여선교대회는 오늘의 여선교회 전국대회에 해당된다. 여선교대회 대신 교단 안에 연합여자사업부가 만들어지고 여선교회는 부인회로 명칭을 바꾸게 되는데 미일전쟁의 발발과 함께 대부분의 활동은 중단되기에 이른다. 해방 이후 여선교회는 한국사회의 혼란만큼이나 우여곡절을 겪게 되는데 여선교회는 부녀국 산하 조직이 되었고 홍에스더는 부녀국 총무가 되었다. 한국전쟁 직후에는 피난지 부산에서 사업을 재개하며 자치적이고 자율적인 위상을 확립하기 위해 노력하였다. 이처럼 여선교회 전국연합회는 여러 고비를 넘으며 오늘에 닿을 수 있었다. 감리교신학교 최초의 한국인 여성 교수이며 한국 기독교 여성운동을 주도한 선구자 홍에스더. 감리교 여선교회 120주년 시점인 오늘 그녀의 눈물 어린 헌신을 되새겨 보는 것은 참으로 의미 있는 일이라 하겠다. It is important to note that the message quoted above can indisputably predict how Esther Hong, elected as the president at the first gathering of Women’s Missionary Society at Jeongdong Church, devoted her twenty years of life to the organization. 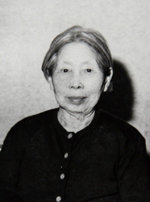 Esther Hong was born as the eldest daughter of Jung Woo Hong and Mary Han in 1892. Esther Hong accepted Christian faith early under the influence of her father. He was a politician and social activist of the independent association. Esther attended Ehwa School. After graduating from Ewha Junior School (equivalent to today’s high school) in 1912, she became a primary school teacher at Ewha Elementary School. 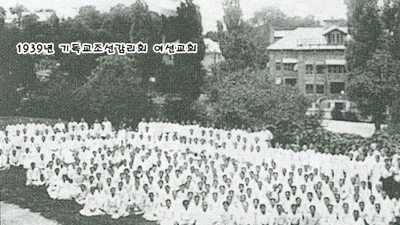 She entered Ehwa College in 1917. While still in college, she organized a “seven-people evangelism group,” and went on an evangelistic journey around the country during summer vacation in 1920. Before they took off to the national pilgrimage, they made a white banner with a red cross around it. They also formed an evangelist band that sang hymns. "We are all soldiers of the cross, we will march to proclaim the kingdom of Christ, and we will march with the gospel in our hand..." The grief and strong patriotism of the young people who lost their country were resonated in the lyrics of the hymns they sang. In June of 1920, the “seven-people evangelism group,” started its first trip to Pyongyang, and initiated door-to-door evangelism during the day. Furthermore, the group visited farmers who worked in the fields and held meetings at the elementary school when the sun was down. Although they were welcomed by many, the surveillance and interruption of the Japanese police were persistent. And after a month, the evangelistic trip had to stop. However, the effort to increase the presence of Methodist women in various locations did succeed. Even though the evangelistic trip was short-lived, it had a great harvest of over five hundred new believers. After graduating from Ewha College in 1922, Esther Hong made her way to study abroad in the United States. After graduating from the Department of Theology at the Scarritt Bennett College, in Tennessee, she returned to Korea in 1926. She became the first female professor at the Methodist Theological Seminary in 1926. At the same time, her full-fledged adventure for the women’s movement started. In 1927, she became the president of the YWCA, the Korean Christian Youth Association, and led a central executive committee when Geun-woo-ae, the anti-Japanese Women’s Movement Body, started. After the March 1st Movement, Esther Hong, who had participated in the education and wide-ranging women’s movements, was elected as the first president of the Christian Korean Methodist Women’s Missionary Society which embraced both the North and South Women’s Missionary Society. As the Christian Korean Methodist Church was established, the ordination of the female pastor was allowed. As a result, fourteen female missionaries became ordained ministers in 1931. The next year, ten more female missionaries were ordained. Although at the time the only Korean woman to be assigned as an ordained minister was Esther Hong, she gave up the ordination after marrying a YMCA activist, Myung-won Lee. It certainly would not have been easy to be married and be active in the ministry because the tradition at that time distinctly stated that the clergy should have no responsibility for family. When Esther Hong was the first president of the Women’s Missionary Society, Japanese imperialism began to suppress the Korean church while preparing for war. In 1941, as a pro-Japanese Christian Korean Methodist Church was established, the meeting of the Women’s Missionary Society was dissolved. This annual meeting of regional representatives of Women's Missionary Society corresponds to the National Women's Assembly of today. Instead of these meetings, the United Women's Division was created in the denomination, and the Women's Missionary Society was changed to a Women’s Society. However, most of the activities stopped with the outbreak of the war between US and Japan. The Women’s Missionary Society suffered in the turmoil of Korean society after independence. It came under the umbrella of Women’s Society and Esther Hong became its executive director. Right after the Korean war, the organization resumed its business in Pusan and made efforts to establish an autonomous position. As recorded above, the National Federation of Women’s Missionary Society went through many hurdles to be what it is today. Esther Hong was the first Korean female professor at Methodist Theological Seminary and a pioneer in the Korean Christian women's movement. Since it is the 120th Anniversary of Methodist Women’s Missionary Society, it is truly meaningful to look back on her steadfast devotion.